The Museum of Aquitaine was officially created in its current form in 1962 on the initiative of the museologist Georges Henri Rivière, who was responsible for the post-war reorganisation of French history, archaeology and ethnology museums. He proposed the establishment of a coherent network of museums on a national scale, with the creation in each regional capital of a general museum to trace the history of the region from its origins. His approach was a new departure from the old local museums which often presented an anecdotal and fragmentary version of history. The intention was for these new museums to be based on scientific research and for them to offer an overall, coherent vision, based on "periodised interdisciplinary programmes". Like the Museum of Normandy and the Museum of Brittany, the Museum of Aquitaine is the product of these intentions. The Museum of Aquitaine initially occupied the north wing of the Musée des Beaux-Arts building. In the 1970s it was decided to install the museum in Cours Pasteur, in the former premises of the Bordeaux Faculty of Sciences and Letters. This building was constructed in the late 19th century by Pierre-Charles Durand, the town architect, on the site of the Convent of the Feuillants where Michel de Montaigne was buried in 1592. An ambitious acquisition policy was implemented alongside the building renovation work, which took place from 1982 to 1986, and the new museum opened its doors to the public in 1987. The new museum enabled the amalgamation of a large number of collections and several museums previously scattered through the town, each with a complex individual story. While most French towns created museums in the 19th century after the great revolutionary projects, Bordeaux created its collections much earlier. The history of the town's museums began in 1594 with the exhibition at the town hall of a Roman marble altar dedicated to Augustus and to the genius of the town by the Gallic tribe of the Bituriges Vivisques. This object was displayed with three imperial statues that the town's humanists requested the local magistrates to preserve. But it was in 1781 that a first "museum" was truly founded, on the initiative of Intendant Dupré of Saint-Maur and implemented by the Bordeaux Académie des Inscriptions et Belles-Lettres. This museum was principally composed of monuments and objects discovered during the significant urban development undertaken in the 18th century. In 1810, what was called the "town museum" included the library, the Natural History Office, the Antiquities Depot, the Observatory, the Art Gallery and the School of Drawing and Painting. In 1853, a separate museum, the "Museum of Weapons" was created, which quickly became the "Museum of Weapons and Ancient Objects", joining the municipal collections of pottery, sculpture, enamels, gold and silverwork, furniture, ironwork and various other objects. According to the catalogue published in 1860 by its conservator, it held around 1200 items. Throughout the 19th century, the "Antiquities Depot" and the "Museum of Weapons and Ancient Objects" were constantly enhanced through acquisitions and also by means of generous collectors. This was the case in 1854, when Alcide Cayrou donated 180 specimens of weapons from the Society Islands (the main archipelago of French Polynesia). Later, in 1863, the exceptional legacy of Doctor Godard presented the "Antiquities Depot" with an Egyptian collection of nearly 800 items. In the same year, the number of items in the Museum of Weapons and Ancient Objects and the Antiquities Depot had already reached 3200. 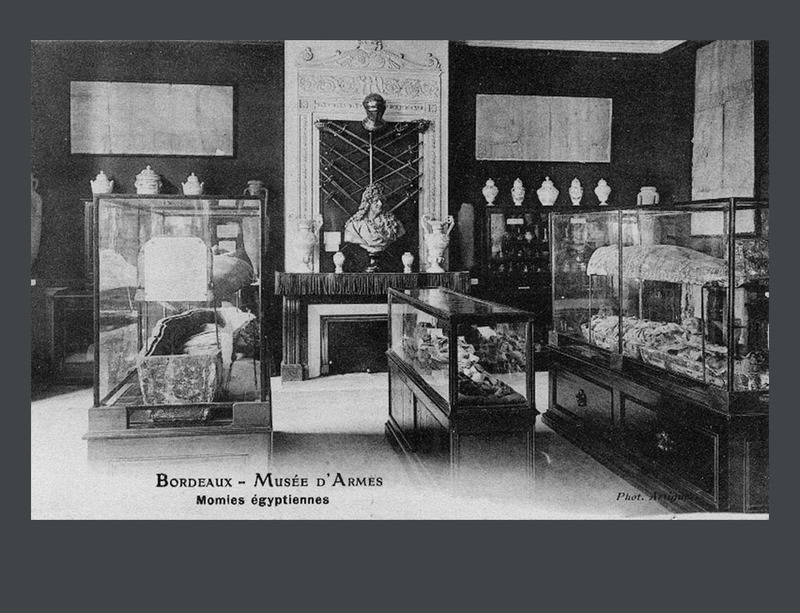 In the late 1860s, the Town of Bordeaux, realising that its lapidary collection had become one of the richest and most interesting in France, attempted to organise a genuine museum and to make more accessible the most remarkable monuments which were then dispersed across several sites. In March 1870, specific premises were officially inaugurated as the "Lapidary Museum". The growth of the municipal collections enabled the creation in 1871 of a "Prehistory Museum" located in the Jardin Public beside the Natural History Museum, which had been established ten years earlier. Its director, Jean-Baptiste Gassies, encouraged donations from Bordeaux sailors and shipowners, and laid the foundations of the ethnography collection. 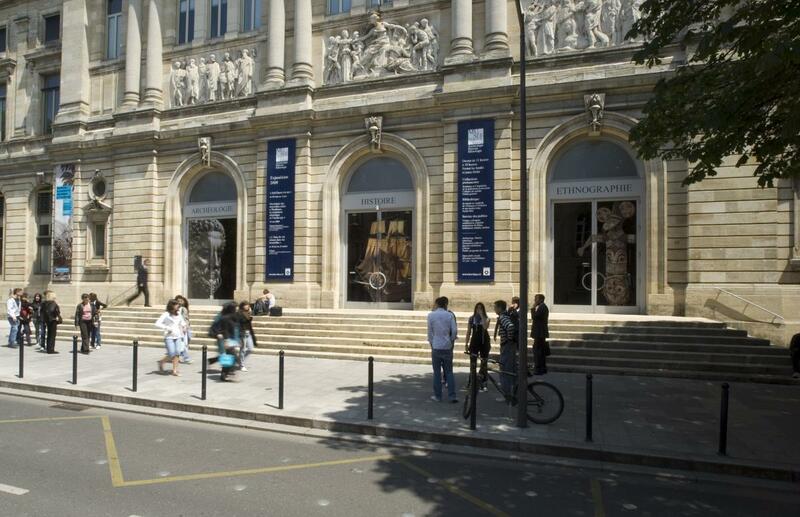 On 20th May 1901, on one of the terraces of the Jardin Public, the Bordeaux Museum of the Colonial Institution was inaugurated, which in addition to products from the colonies exhibited ethnographic objects imported from the same countries. In parallel with the development of the municipal museums, private collections – sometimes of very high quality – were constituted and gave birth to private museums. These include the Bonie Museum, established in Bordeaux in 1856 and presenting ancient objects of all sorts and all countries collected by Edouard Bonie during his numerous voyages throughout the world. In 1894, this collection was left to the Town of Bordeaux, along with the private house that housed it and in which Mr. Bonie had reconstructed "an Arab smokehouse and an oriental patio". With a view to studying and preserving the local heritage, many well-known Bordeaux residents became involved in the Archaeological Society founded in 1873 by Pierre Sansas. 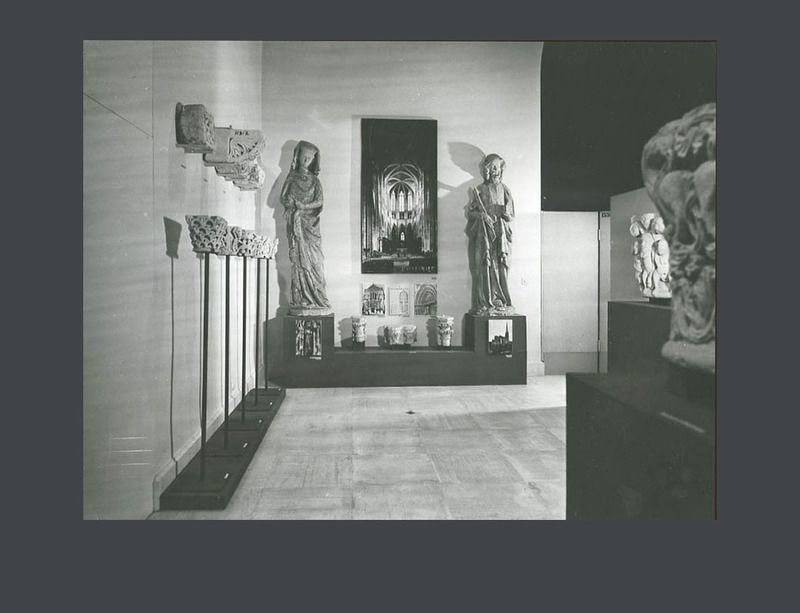 In 1908, having failed to achieve the official creation of an archaeological museum worthy of the name, the Archaeological Society resolved to open its own museum, the Museum of Old Bordeaux, at Porte Cailhau. Initial donations from its members, rapidly supplemented by those from other Bordeaux residents, formed the basis of the museum's collections. In the early 20th century, the Museum of Weapons and Ancient Objects together with part of the Antiquities Depot's collections, were presented in a new venue on the Carreire estate, on the edge of the town. In 1923, it was decided to create a Museum of Ancient Art based on the collections of the Carreire Museum, in the town centre Hotel de Lalande. During the Second World War, most of the museums were closed and remained so until the early 1950s. After the war, an inventory of all of the town's collections was carried out, which led to a reorganisation of the museums. The Museum of Ancient Art was transformed into the Museum of Decorative Arts from the Middle Ages to the late 18th century. The Carreire Museum, which still contained the Egyptian collection, the weapons, "folklore", model ships, and some of the ethnographic collections, was closed and its collections partly integrated into the new Archaeology Museum, constituted from the collections of the "Lapidary Museum". This complete review of the collections of all the town's museums and the conclusions that resulted from the review led to the agglomeration of part of these collections within the new Museum of Aquitaine, established and directed by Louis Valensi. In the late 1970s, the collections of the Naval Museum, created in 1952, together with those of the Bordeaux Archaeological Society, were deposited at the Museum of Aquitaine. The prestigious character of its collections has led to the Museum of Aquitaine becoming a heritage standard in France today. Its diverse collections, varying from regional archaeology and ethnology to non-European civilisations, also make it an encyclopaedic museum with an extremely wide range of temporary exhibitions. In 2009, the renovation of the museum's permanent spaces was undertaken, starting with the 18th century. These new rooms place great emphasis on the trans-Atlantic trade and slavery, in line with the new scientific and cultural plan that aims to establish the history of the relationships between Bordeaux and the rest of the world through time. The museum is today defined both as a "heritage museum" which presents collections of general interest and as a "museum of civilisation" which examines the past to answer contemporary questions. It is both a historical and cultural reference centre for the town and the region, and a window on the world.